Skin is a marvelous organ that protects the body, senses the external world and even expresses emotion. In the hands of Elaine Fuchs, Ph.D., recipient of the 2016 Vanderbilt Prize in Biomedical Science, skin also lies squarely in the intersection of normal growth, wound repair and cancer. “I’ve always been fascinated by the skin,” said Fuchs, the Rebecca C. Lancefield Professor and head of the Robin Chemers Neustein Laboratory of Mammalian Cell Biology and Development at the Rockefeller University in New York. 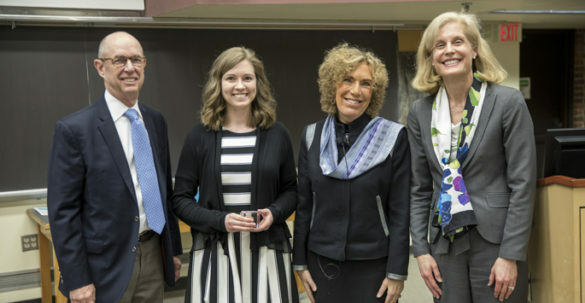 “I think Nature clearly had a lot more fun and fancy in creating body surfaces than she has in creating any of the organs most scientists study,” she said during her Vanderbilt Prize Lecture, delivered last week as part of the Flexner Discovery Lecture series. Fuchs is the 11th recipient of the prize, which honors women scientists who have made significant contributions to research and to mentoring other women in science. As part of her prize, she will mentor the 2016 Vanderbilt Prize Scholar, Chloe Snider. Snider, a graduate student in the lab of Kathleen Gould, Ph.D., was introduced by Jennifer Pietenpol, Ph.D., director of the Vanderbilt-Ingram Cancer Center and Executive Vice President for Research at Vanderbilt University Medical Center. Lawrence Marnett, Ph.D., dean of Basic Sciences in the Vanderbilt University School of Medicine, introduced Fuchs’ accomplishments, and Pietenpol presented her with the sculpture “Mentor,” which symbolizes the spirit of the Vanderbilt Prize. Fuchs’ lecture detailed her investigations of how epidermal stem cells respond to environmental signals, communicate with their neighbors and differentiate in a precisely orchestrated manner into epidermis, hair follicles and sweat glands. The Fuchs lab has conducted genome-wide screens for oncogenic regulators, tumor suppressors, oncogenic microRNAs and genes that perturb the balance between differentiation and proliferation. Studies in mice led to the discovery of a population of tumor-initiating stem cells that is slow-cycling, invasive and resistant to chemotherapy. Skin has a remarkable capacity to repair itself. But when repair mechanisms are disrupted by genetic mutation, cancer can result. “Cancer is effectively hijacking these fundamental repair mechanisms,” she said.